A Southwest Inn is a unique combination of a small luxury hotel and a top quality bed and breakfast, with large beautiful rooms and fantastic customer service. The Inn has been awarded the AAA Four Diamond rating for its quality and attention to detail for the past 8 years in a row. 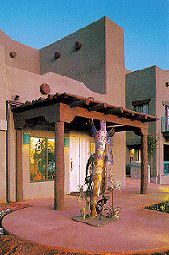 Readers of the "Sedona Scene" have voted the Southwest Inn "the best place to stay in Sedona" three years in a row. The entire property is non-smoking, with 28 King, Dual Queen and 2-room suites available. All rooms have 25" TV's, VCR's, refrigerators, coffee makers and telephones. Local and "800- number" calls are free. Each room has a fireplace, wonderful southwest decor and a patio or deck facing magnificent red rock views. A deluxe continental breakfast is included in the rates. An outdoor spa and pool are available as well as an exercise room. A concierge is on hand to help plan your activities and make your reservations for dinners and tours. A recent addition to the inn is a private meeting room and an internet cafe with high speed internet access. In addition each room has two telephone lines with a modem jack. The inn's telephone system provides 28 outgoing lines - so you never get a busy signal trying to dial out. Located near all the varied activities, horseback riding, hiking, jeep rentals & tours, ballooning, restaurants, theaters & galleries, the Southwest Inn is "Inn place to stay" in Sedona combining leisure and adventure. Rates: $99 - $239 depending on room type and season (also spa, railroad & honeymoon/romance packages) - see our web-site for internet special rates. This and other Sedona Bed and Breakfast Inns can be found here in The Register. Romantic Country Inns, Getaways and B&Bs offer a great Arizona lodging alternative to big hotels.